Neapolitan ice cream with its three stripes of flavor, vanilla, chocolate and strawberry, was a favorite in my house when I was growing up. 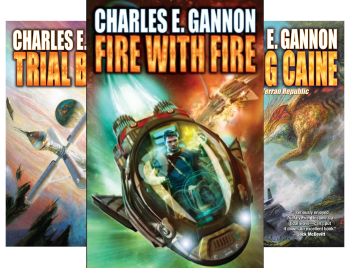 Charles E. Gannon’s latest novel Raising Caine reminds me of that. Do you like rollicking high-tech military SF? Get yourself a bowl. You want multi-planetary space opera with unusual environments and nonhuman exo-sapients? Dish up. You want a book that makes you think about the nexus of biological evolution and social evolution? Grab a spoon, because this one’s for you. On the heels of Earth’s successful defense against an occupation attempt by the Hkh’Rkh, Caine Riordan barely gets a chance to recuperate before he is assigned by intelligencer Richard Downing to a diplomatic delegation requested by the Slaasriithi. Although the Slaasriithi are personally friendly with Caine — almost suspiciously so — they, like the other advanced species, have been keeping humanity at a discreet distance. Their request is startling, and a little unnerving, since the Slaasrrithi refuse to answer questions, saying only that the humans must see the Slaasriithi worlds in order to understand their race. The humans of the delegation jump at this chance to learn more. Before they learn very much, though, they are attacked by an unseen enemy and stranded on a planet whose entire ecosystem seems hostile to them. In the previous books, Gannon gave us a villain we loved to hate: the olive-eating man. He has real competition in Raising Caine, though, in the form of Nezdeh, a rebel leader who is a member of a renegade family of the Ktor. As the rebels hijack a Terran ship, we see the rigid hierarchal culture of the Ktor, and learn the source of their animosity toward Terrans. Nezdeh is an intelligent, ruthless strategist, untouched by love or compassion, and those deficits are traits the Ktor have cultivated, and actually admire. Gannon always creates interesting non-humans, and with the Slaasriithi he goes over the top. This species meets various social needs by bioengineering everything around them, including themselves. In a tightrope-walking dance, the Slassriithi intervene consciously in their own evolution. I’ll admit that my “suspension of disbelief” needle bumped up into the red with the Slaasriithi, but ultimately, Gannon persuaded me by making the Slaasriithi characters behave in a way that is consistent with their biology, even when they have emotional conflicts as a result of it. For instance, Thnessfiirm, who spends a lot of time with Caine and the other human, experiences cognitive dissonance and distress when her biological programming and her ethics conflict with her empathy. In other words, Thnessfiirm and the others we meet are people, grappling with life decisions and ethical decisions in a way we can appreciate. The book is very “big picture” but it doesn’t ignore the personal. Caine, undisputed leader of the diplomatic delegation, faces a serious personal challenge when he reacts badly to some spores on the planet. His condition gets worse and worse, and soon he is risking his own health by continuing to lead, but his compulsion to protect others won’t let him stop. Nezdeh and the other renegade Ktor are acting out of a toxic form of family pride, and even the human mole in the delegation has motivations we can understand and even sympathize with. 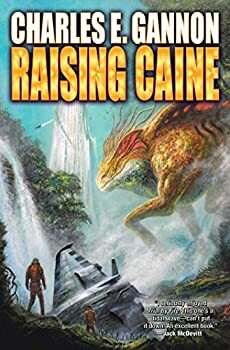 Raising Caine unveils a lot of thought-provoking ideas but ultimately this is a space opera adventure. There are space battles, daring emergency landings, desperate quests, hand-to-hand combat and double-and-triple crosses. It’s an engrossing read. You owe it to yourself to read the two previous books in order. Then enjoy Raising Caine. It’s an intergalactic thrill-ride. Publication date: October 6, 2015. Book Three in the Nebula award nominated and Compton Crook award winning series. Science fiction adventure on a grand scale. Caine Riordan, reluctant diplomatic and military intelligence operative, has just finished playing his part repulsing the Arat Kur’s and Hkh’Rkh’s joint invasion of Earth. But scant hours after the attackers surrender, the mysterious but potentially helpful Slaasriithi appeal to Caine to shepherd a diplomatic mission on a visit to their very alien worlds. The possible prize: a crucial alliance in a universe where the fledgling Consolidated Terran Republic has very few friends. But Caine and his legation aren’t the only ones journeying into the unknown reaches of Slaasriithi space. A group of renegade Ktor are following them, intending to destroy humanity’s hopes for a quick alliance. And that means finding and killing Caine Riordan. Assuming that the bizarre and dangerous Slaasriithi lifeforms don’t do it first. Thanks for the note to read the series in order–sometimes it’s hard to know whether that’s necessary or not. There are so many clues planted in the earlier books, I really think you have to. I’m going to read these. Thanks, Marion! I only read the first paragraph of your review because I have the books and don’t want to read any spoilers — but your reviews are what got me interested in these. Thanks, Marion! But you said spoilers! I believed you! Gannon’s comments on your Facebook page are hilarious. Oh, I see that the review does, indeed, say that. Terrific review, Marion and love that the author carried the convo into his Facebook world. Wow, he put us in the same sentence with Publishers Weekly!